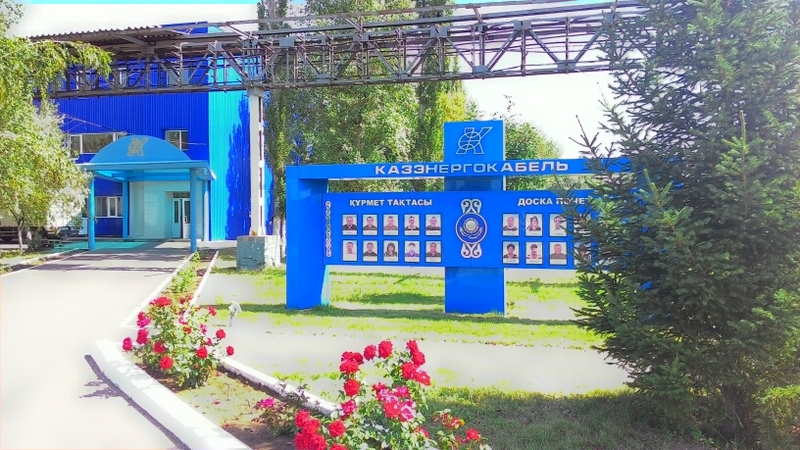 «Kazenergokabel» JSC was founded in the year of 1994. Cable factory construction was carried out at the conversion sites of «Chimprom» production association. 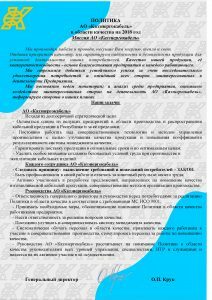 The project was implemented in accordance with the Decree of the President of the Republic of Kazakhstan «On defense industry development and conversion», processing plant development project, approved by the Cabinet of Ministers of the Republic of Kazakhstan and included in the list of the top-priority investment projects. The factory has all required infrastructure and modern premises: production, administrative, warehousing as well as household premises and various auxiliary premises. The factory is equipped with modern production and technological equipment. 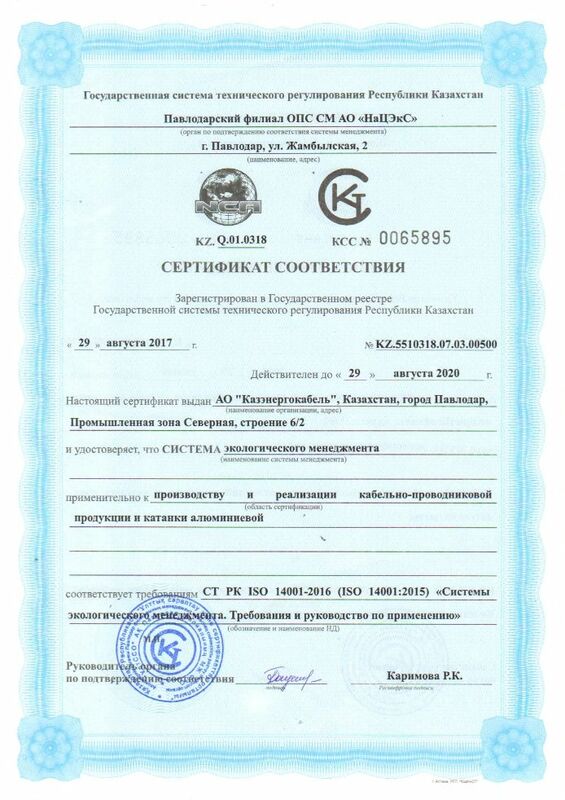 «Kazenergokabel» JSC proceeded to manufacture of new batches of products – mainly bare conductors – in the year of 1994 while constructing new building of the enterprise at the same time. In the year of 1999 the factory proceeded to industrial production of limited line cabling and wiring products. As of today «Kazenergokabel» JSC is the largest domestic manufacturer of cabling and wiring products and the output products nomenclature includes more than 700 items. The advanced branch network (Astana, Almaty, Aktobe, and Aktau) allows offering the best delivery conditions almost for any region of Kazakhstan. 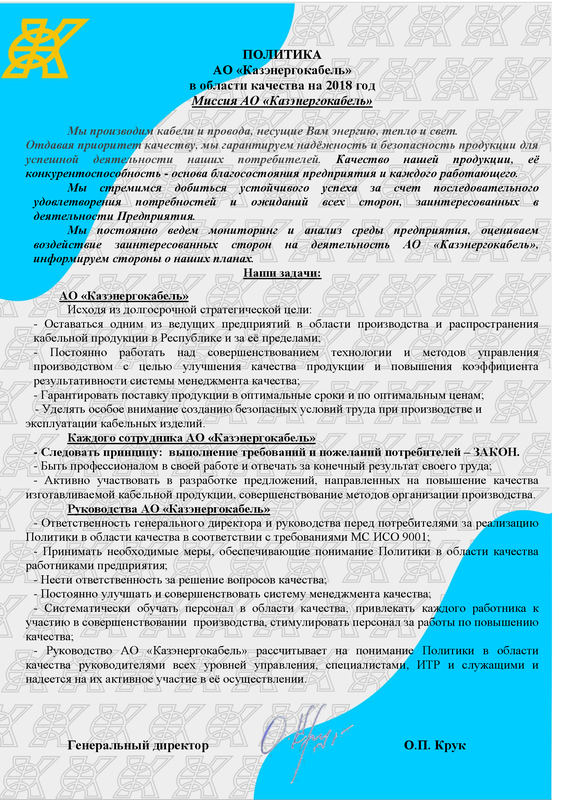 «Conference of Employers of the Republic of Kazakhstan», «Union of Machine Engineers of Kazakhstan». 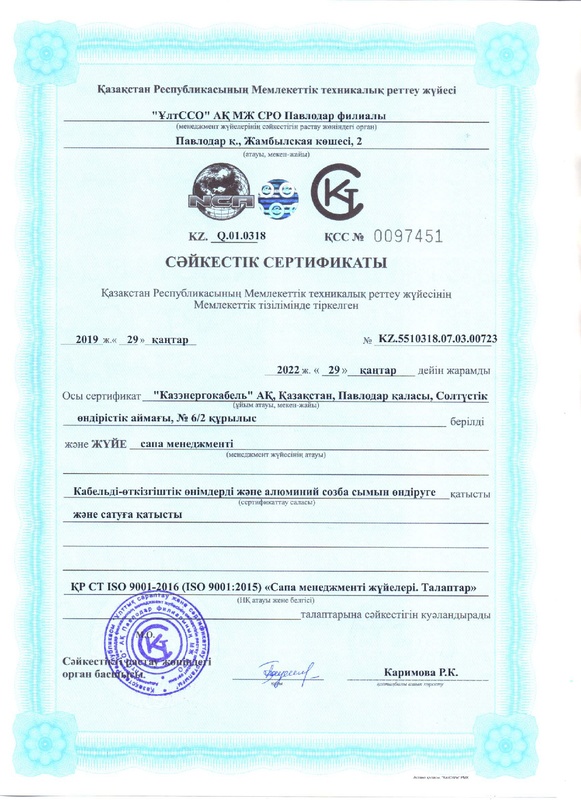 «Kazenergokabel» JSC is registered in the Registry of the domestic commodity produces formed by «National Welfare Fund ‘Samruk-Kazyna” JSC under registration number 004189. 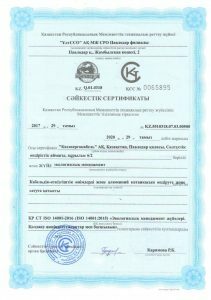 «Kazenergokabel» JSC is also registered in the List of conscientious suppliers formed by “National Welfare Fund «Samruk-Kazyna» JSC under registration number 11. 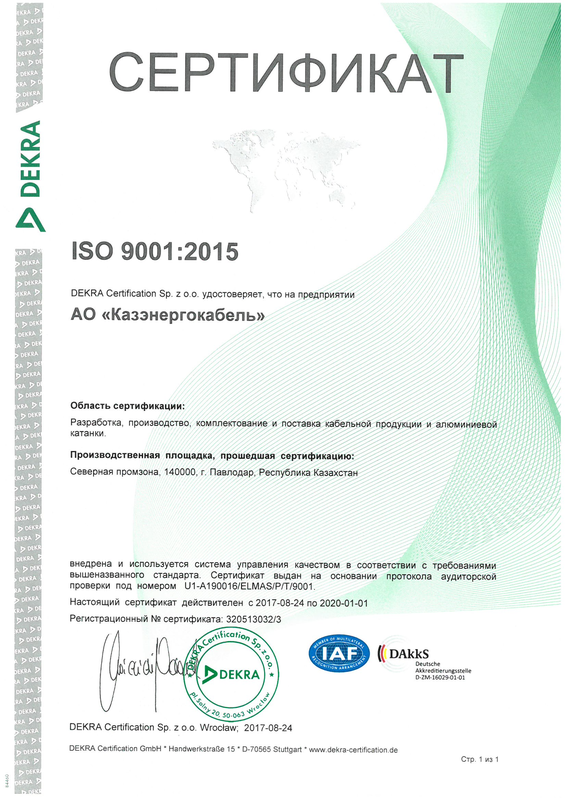 The high level of quality parameters stability is achieved by means of turning out the products consistent with the international, interstate standards, receipt of the high quality raw materials, using of the imported equipment, modern technologies, and introduction of the company quality system consistent with ISO 9001. 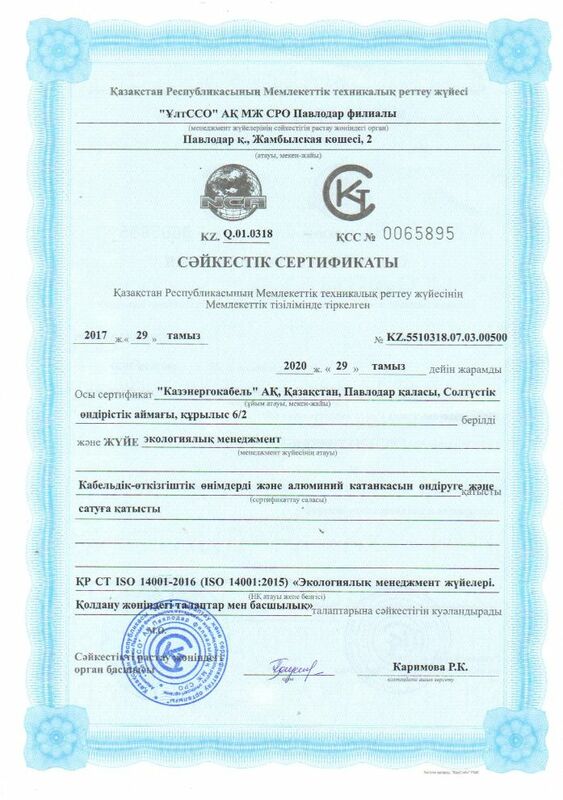 The company has a certificate of origin by ST-KZ form with specification of the share of the Kazakhstan content in the output products (from 70% to 100%). In November 2007 the company was awarded with a Diploma at the Republican competition – exhibition «Altyn Sapa» in nomination «The best industrial goods». 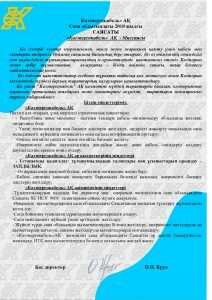 In the year of 2010 with the financial cooperation of «Corporation Kazakhmys» LLP the investment project «Aluminum wire rod production» was implemented which was included in the program of the forced industrial and innovative development of the Republic of Kazakhstan for the years of 2010 – 2014. 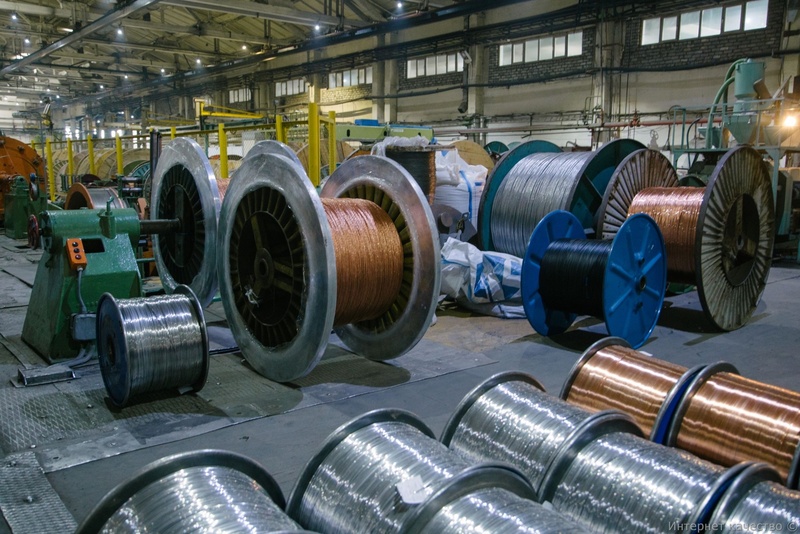 This project allowed reducing the raw-material dependence on the foreign suppliers, increasing the share of the Kazakhstan content in the aluminum core cables and conductors as well as reducing the material expenses incidental to manufacturing of the cabling and wiring products. The project productive capacity makes 15,000 tons of aluminum wire rod per year. In 2017, the manufacture of flexible thermoplastic elastomer cable and thermoplastic elastomer cable cables with insulation and sheath of thermoplastic elastomer (which are a complete analog of the Russian flexible cable and flexible cablecold-resistant brands), whose technical characteristics are superior to their Russian counterparts, was mastered. In 2018, a project for the serial production of cables and wires from aluminum alloy was successfully implemented, which will allow the end user to significantly reduce the cost of purchasing products that are not inferior in their characteristics to copper analogues. And also, the manufacture of cable based on halogen-free compositions was mastered, which made it possible to ensure the output of products, the quality of which fully complies with international standards for non-proliferation of combustion. Currently, the company is working on the development of manufacturing fiber optic cable, the project is scheduled for 2019. Continuous improvement of technology, the use of new materials, the development of new types of cabling and wiring products, the introduction of a computerized system of order planning and quality control, allow us to fulfill production orders in the shortest possible time, to form flexible prices and deliver high-quality products. High level of stability of quality indicators is achieved through the production of products according to international, interstate standards, the receipt of high-quality raw materials, the use of imported equipment, modern technology, the introduction of an enterprise quality system conforming to the ISO 9000 series standards, etc. 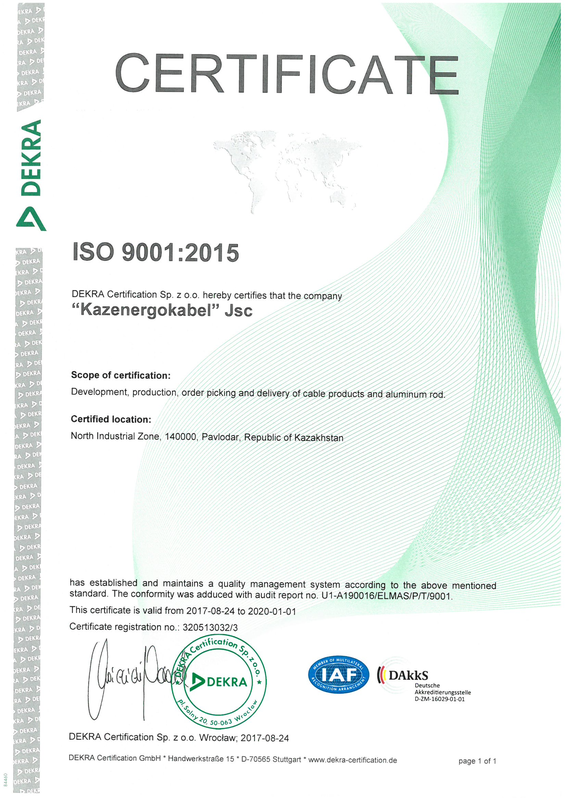 In 2004 year, the plant received the certificate of the Republic of Kazakhstan for compliance with the quality management system ISO 9001-2001, and in January 2005 – the international certificate of conformity of the quality management system from KEMA Quality B.V. (Netherlands) – from 2011 DEKRA Certification B.V. (Netherlands). The environmental management system (EMS) at JSC «Kazenergokabel» was introduced in 2014. In 2017, a re-certification audit was conducted, which resulted in the issuance of a certificate of compliance with the requirements of ST RK ISO 14001-2016 (ISO 14001: 2015) in relation to the production and sale of cable and aluminum products and wire rods. This certificate confirms that the plant takes care of the environment, manages the environmental aspects of the enterprise, thereby preventing its contamination.